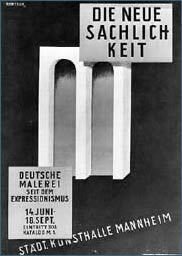 Nazi Germany disapproved of contemporary German art movements such as Expressionism and Dada and on July 19, 1937 it opened the Degenerate art travelling exhibition in the Haus der Kunst in Munich, consisting of modernist artworks chaotically hung and accompanied by text labels deriding the art, to inflame public opinion against modernity. German art describes the history of the visual arts in Germany. German art and art of the Germanophone world (Austria, Switzerland and Germany) share stylistic similarities. Notable pre-20th century artists include Hans Baldung Grien, Hans Holbein, Matthias Grünewald, Lucas Cranach, Albrecht Dürer, Martin Schongauer and Albrecht Altdorfer. Notable 19th and 20th century artists include Max Klinger, Paul Scheerbart, Max Beckmann, Otto Dix, George Grosz, Hans Bellmer, Joseph Beuys, and Anselm Kiefer. The German Renaissance was a result of German artists such as Albrecht Dürer who had travelled to Italy to learn more and become inspired by the Renaissance movement. As Renaissance art techniques moved to northern Europe, they changed and were adapted to local circumstances. Notable painters of the period include Albrecht Dürer, Lucas Cranach the Elder, Hans Holbein, Matthias Grünewald and Hans Baldung Grien. Paintings by these artists retain a Gothic influence. German art of this period was more concerned with Christianity than with Greco-Roman mythology, in part a reflection of the turmoil of the Protestant Reformation. The Baroque and Rococo periods saw German art producing mostly works derivative of developments elsewhere, though numbers of skilled artists in various genres were active. The period remains little-known outside Germany, and though it "never made any claim to be among the great schools of painting", its neglect by non-German art history remains striking. Many distinguished foreign painters spent periods working in Germany for princes, among them Bernardo Bellotto in Dresden and elsewhere, and Gianbattista Tiepolo, who spent three years painting the Würzburg Residence with his son. Many German painters worked abroad, including Johann Liss who worked mainly in Venice, Joachim von Sandrart and Ludolf Bakhuisen, the leading marine artist of the final years of Dutch Golden Age painting. In the late 18th century the portraitist Heinrich Füger and his pupil Johann Peter Krafft, whose best known works are three large murals in the Hofburg, had both moved to Vienna as students and stayed there. Neoclassicism appears rather earlier in Germany than in France, with Anton Raphael Mengs (1728-79), the Danish painter Asmus Jacob Carstens (1754-98), and the sculptor Gottfried Schadow (1764-1850). Mengs was one of the most highly regarded artists of his day, working in Rome, Madrid and elsewhere, and finding an early Neo-Classical style that now seems rather effete, although his portraits are more effective. Carstens' shorter career was turbulent and troubled, leaving a trail of unfinished works, but through pupils and friends such as Gottlieb Schick, Joseph Anton Koch and Bonaventura Genelli, more influential. Koch was born in the mountains of the Austrian Tyrol and became the leading Continental painter of landscapes, concentrating on mountain views, despite spending much of his career in Rome. Daniel Chodowiecki was born in Danzig, and at least partly identified as Polish, although he only spoke German and French. His paintings and hundreds of prints, book illustrations and political cartoons are an invaluable visual record of the everyday life and the increasingly complex mentality of Enlightenment Germany, and its emerging Nationalism. The Swiss-born Anton Graff was a prolific portraitist in Dresden, who painted literary figures as well as the court. The Tischbein dynasty were solid all-rounders who covered most of the 18th century between them, as did the Zick family, initially mainly painters of grand Baroque ceilings, who were still active in the 20th century in the person of the illustrator Alexander Zick. Both the Asam brothers, and Johann Baptist Zimmermann and his brother, were able between them to provide a complete service for commissions for churches and palaces, designing the building and executing the stucco and wall-paintings. The combined effect of all the elements of these buildings in South Germany, Austria and Bohemia, especially their interiors, represent some of the most complete and extreme realizations of the Baroque aspiration to overwhelm the viewer with the "radiant fairy world of the nobleman's dwelling", or the "foretaste of the glories of Paradise" in the case of churches. The Enlightenment period saw German writers becoming leading theorists and critics or art, led by Johann Joachim Winckelmann, who exalted Ancient Greek art and, despite never visiting Greece or actually seeing many Ancient Greek statues, set out an analysis distinguishing between the main periods of Ancient Greek art, and relating them to wider historical movements. Winckelmann's work marked the entry of art history into the high-philosophical discourse of German culture; he was read avidly by Goethe and Friedrich Schiller, both of whom began to write on the history of art, and his account of the Laocoon occasioned a response by Lessing. The emergence of art as a major subject of philosophical speculation was solidified by the appearance of Immanuel Kant's Critique of Judgment in 1790, and was furthered by Hegel's Lectures on Aesthetics. In the following century German universities were the first teach art history as an academic subject, beginning the leading position that Germany (and Austria) was to occupy in the study of art history until the dispersal of scholars abroad in the Nazi period. Johann Gottfried Herder championed what he identified in the Gothic and Dürer as specifically Germanic styles, beginning an argument over the proper models for a German artist against the so-called "Tyranny of Greece over Germany" that would last nearly two centuries. German Romanticism saw a revival of innovation and distinctiveness in German art. Outside Germany only Caspar David Friedrich is well-known, but there were a number of artists with very individual styles, notably Philipp Otto Runge, who like Friedrich had trained at the Copenhagen Academy and was forgotten after his death until a revival in the 20th century. 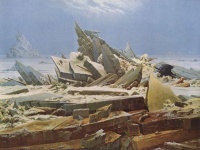 Friedrich painted almost entirely landscapes, with a distinctive Northern feel, and always a feeling of quasi-religious stillness. 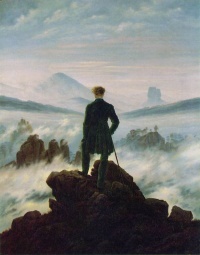 Often his figures are seen from behind - they like the viewer are lost in contemplation of the landscape. Runge's portraits, mostly of his own circle, are naturalistic except for his huge-faced children, but the other works in his brief career increasingly reflected a visionary pantheism. Adrian Ludwig Richter is mainly remembered for his portraits, and Carl Wilhelm Kolbe was purely an etcher (as well as a philologist), whose later prints show figures almost swallowed up by gigantic vegetation. The Nazarene movement, the coinage of a mocking critic, denotes a group of early nineteenth century German Romantic painters who aimed to revive honesty and spirituality in Christian art. The principal motivation of the Nazarenes was a reaction against Neoclassicism and the routine art education of the academy system. They hoped to return to art which embodied spiritual values, and sought inspiration in artists of the late Middle Ages and early Renaissance, rejecting what they saw as the superficial virtuosity of later art. Their programme was not dissimilar to that of the English Pre-Raphaelite Brotherhood in the 1850s, although the core group took it as far as wearing special pseudo-medieval clothing. In 1810 Johann Friedrich Overbeck, Franz Pforr, Ludwig Vogel and the Swiss Johann Konrad Hottinger moved to Rome, where they occupied the abandoned monastery of San Isidoro. They were joined by Philipp Veit, Peter von Cornelius, Julius Schnorr von Carolsfeld, Friedrich Wilhelm Schadow and a loose grouping of other German artists. They met up with the Austrian romantic landscape artist Joseph Anton Koch, (1768–1839) who became an unofficial tutor to the group. In 1827 they were joined by Joseph von Führich, and Eberhard Wächter was later associated with the group. Unlike the strong support given to the Pre-Raphaelites by the dominant art critic of the day, John Ruskin, Goethe was dismissive of the Nazarenes: "This the first case in the history of art when real talents have taken the fancy to form themselves backwards by retreating into their mother's womb, and thus found a new epoch in art." Adolph Menzel enjoyed enormous popularity both among the German public and officialdom; at his funeral Kaiser Wilhelm II walked behind his coffin. He dramaticised past and contemporary Prussian military successes both in paintings and brilliant wood engravings illustrating books, yet his domestic subjects are intimate and touching. He followed the development of early Impressionism to create a style that he used for depicting grand public occasions, among other subjects like his Studio Wall. Karl von Piloty was a leading academic painter of history subjects in the latter part of the century who taught in Munich; among his more famous pupils were Hans Makart, Franz von Lenbach, Franz Defregger, Gabriel von Max and Eduard von Grützner. The term "Munich school" is used both of German and of Greek painting, after Greeks like Georgios Jakobides studied under him. The Berlin Secession was a group founded in 1898 by painters including Max Liebermann, who broadly shared the artistic approach of Manet and the French Impressionists, and Lovis Corinth then still painting in a naturalistic style. The group survived until the 1930s, despite splits, and its regular exhibitions helped launch the next two generations of Berlin artists, without imposing a particular style. Near the end of the century, the Benedictine Beuron Art School developed a style, mostly for religious murals, in rather muted colours, with a medievalist interest in pattern that drew from Les Nabis and in some ways looked forward to Art Nouveau or the Jugendstil ("Youth Style") as it is known in German. Franz von Stuck and Max Klinger are the leading German Symbolist painters. Plakatstil, was an early poster style of art that began in the early 1900s and originated out of Germany. "Plakatstil" means "poster style" in German. The traits of this style of art are usually bold, straight font with very simple design. Der Blaue Reiter established in Munich, Germany in 1911. Wassily Kandinsky, Franz Marc, August Macke, Alexej von Jawlensky, Marianne von Werefkin and others founded the group in response to the rejection of Kandinsky's painting Last Judgement from an exhibition by Neue Künstlervereinigung. Die Brücke was a group of German expressionist artists formed in Dresden in 1905. 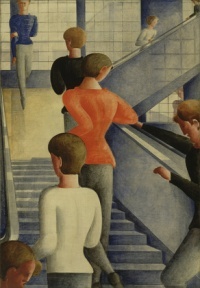 Degenerate art (from the German: entartete Kunst) was the official platform adopted by the Nazi regime for banning modern art in favor of Heroic Art. According to Nazi thinking, Heroic Art symbolized racially pure art, free from distortion and corruption, while modern styles deviated from the prescribed norm of classical beauty. While the 1920s to 1940s are considered the heyday of modern art movements, there were conflicting nationalistic movements that resented abstract art, and Germany was no exception. Avant-garde German artists, mostly Expressionists, were now branded both enemies of the state and a threat to the German nation. Many went into exile and lost both their reputations and credibility. 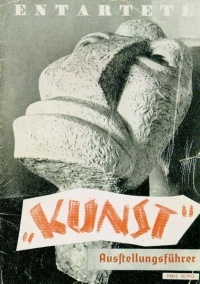 The entartete Kunst exhibit premiered in Munich in March, 1937, and travelled to eleven other cities in Germany and Austria. The show was intended as an official condemnation of modern art, and included over 650 paintings, sculptures, prints, and books from the collections of thirty two German museums. Expressionism, which had its origins in Germany, contained the largest proportion of paintings represented. It was considered the first blockbuster art exhibit of the twentieth century, with an estimated attendance of three million visitors. The exhibition was far more popular than the nearby exhibition of officially sponsored so called heroic art. The SPUR-artists met first at the Akademie der Bildenden Künste in Munich, Germany. Unless indicated otherwise, the text in this article is either based on Wikipedia article "German art" or another language Wikipedia page thereof used under the terms of the GNU Free Documentation License; or on original research by Jahsonic and friends. See Art and Popular Culture's copyright notice. This page was last modified 20:46, 9 July 2014.